These Pimento Cheese, Bacon and Fried Egg Sandwiches are great for breakfast or dinner & finished in 30 minutes! Plus, a quick variation to make it spicy! I know I’ve mentioned this once or twice, but we just recently moved from the South. While we lived there, I made a friend named Catie, who by every measure possible is the picture of Southern Living. She’s also the sweet as pie friend who threw my baby shower before Adelaide was born. In true Southern form, there were a few staples: cheese straws, fruit salad, sweet tea, etc… Then there were these bacon & pimento cheese sliders. Pimento cheese isn’t my thing. Or at least it wasn’t until those sliders entered my life! Now that I’ve moved there are days when I miss Catie’s pimento cheese; especially when I see a fun group function on facebook that I know she made those sliders for! It causes massive food jealousy and cravings! So, with my sweet friend and her delicious food in mind, I bring you the Pimento Cheese, Bacon and Fried Egg Sandwiches. I thought it a fitting way to wrap up the savory dishes for our month of eggs! Sandwiches are a pretty straightforward food, but there is always room for improvement. Here are some skills & techniques I recommend brushing up on to reach master sandwich-maker level. 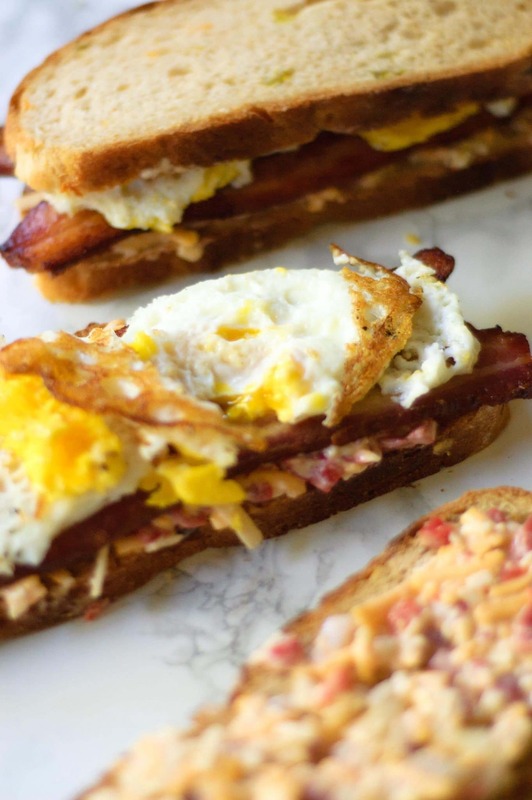 Don’t you think these Pimento Cheese, Bacon and Fried Egg Sandwiches deserve it? How to Cook Eggs In Stainless Steel Cookware. For if you don’t use nonstick or cast iron. How to Buy & Store Eggs. To help navigate the lingo of the grocery store and keep them fresh when they’re home. Homemade Mayonnaise in 2 Minutes. For the mayonnaise in the pimento cheese. How To Buy & Store Bacon. This explains the different thicknesses, cures, and flavors of bacon. Plus some other tips. If you have any leftovers of these Pimento Cheese, Bacon and Fried Egg Sandwiches to enjoy later, I recommend storing them as separately as possible. This will help prevent sogginess. Even if you’ve already assembled your sandwiches, don’t fret, it’s not a loss! Your sandwiches (or separate ingredients) can be kept in the refrigerator in an air-tight container for up to 3 days. If you’re able to store your bread in a tightly sealed container at room temperature, all the better! Bread goes stale faster when stored in the fridge. Place your sandwich on a piece of parchment paper or a silcone mat and bake for 10 minutes, or until warmed throughout. To help make this process go faster, you can reheat your sandwich open faced (which means two halves side by side with the goodies on top) and cut the time in half. I highly recommend the open faced method if you can do it. Depending on how you stored your sandwich though, it may cause more harm than good to pull the two halves apart. I recommend using a jalapeno cheddar bread for this recipe to give it an extra tasty kick. If you don’t have/can’t make/can’t find any, a standard french or sourdough will taste great, too! This pimento cheese mixture is already a little spicier than than most basic recipes. If you want to increase it more, you want to add in 1/4 – 1/2 c. roughly chopped pickled jalapenos. If you like a little heat in your sandwiches – you will not regret that choice! 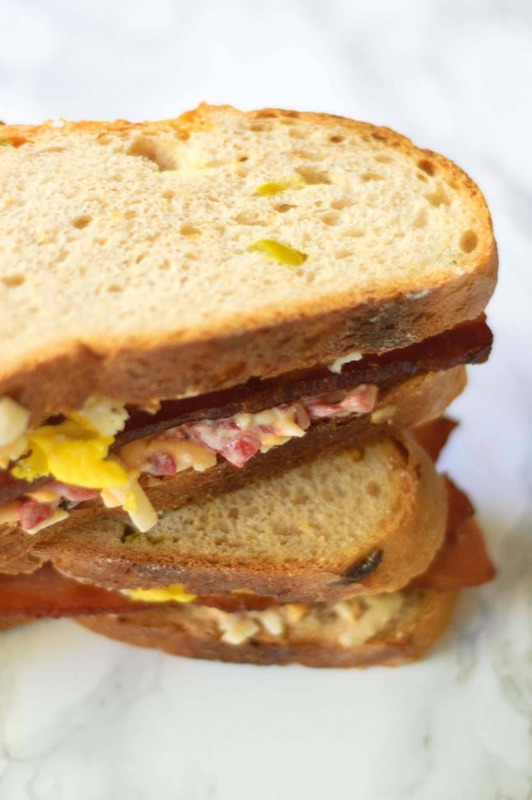 Get your free grocery list for this Pimento Cheese, Bacon & Fried Egg Sandwiches recipe HERE. 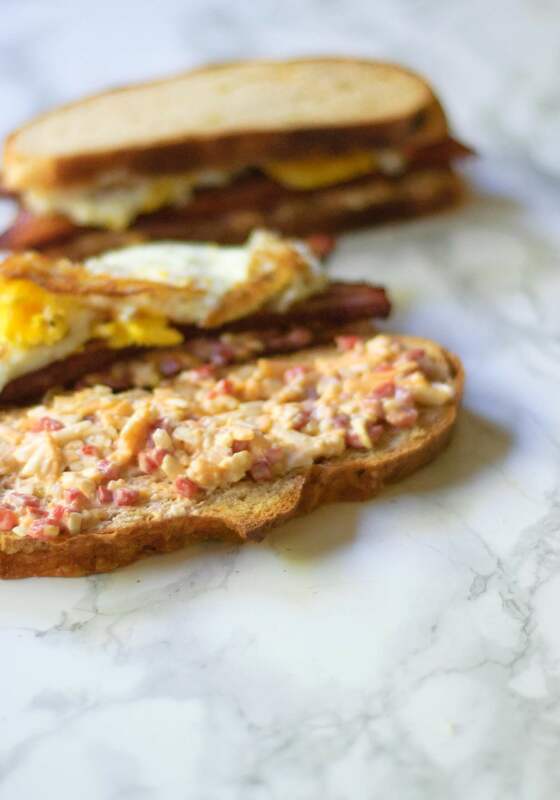 This grocery list has everything that you’ll need to make this Pimento Cheese, Bacon and Fried Egg Sandwiches recipe. To help in making grocery shopping simple, each ingredient is listed in easy-to-find grocery store amounts. If there is no amount specified, that means that you can buy the smallest (or largest) container available and still have plenty left over. 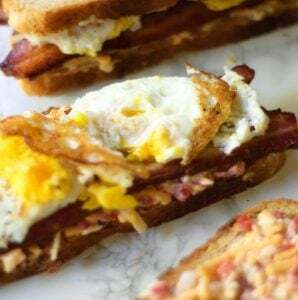 These Pimento, Bacon and Fried Egg sandwiches are great for breakfast or dinner and are done in 30 minutes! This is sure to be quick favorite - they are packed full of delicious flavor and have the option to be made spicy! Place the bacon on a sheet pan lined with aluminum foil. Bake for 15 Minutes or until the bacon is as crispy as you like. The time will vary depending on how thick the bacon is cut. While the bacon cooks, mix together the cream cheese, mayonnaise, Worcestershire, dijon, lemon juice, Tabasco and salt until smooth. Fold in the red onion, garlic, shredded sharp cheddar, shredded white cheddar, pimentos and optional pickled jalapenos until combined. Season with pepper and balance with sugar if needed. Set aside. While you wait for your bacon to finish go ahead and start the fried eggs. While the bacon finishes cooking or begins cooling, heat up a large skillet over medium heat until water splashed on it beads and dances around the skillet. If it immediately evaporates, it's too hot. Pour in 1 Tablespoon of your cooking oil and immediately add in 4 eggs. Lower the heat to medium low and cook until the egg whites have set, about 4 Minutes. Season them with salt and pepper, then flip the eggs and cook on the other side for 1 Minute. You may want to cook it longer for a more solid yolk. Transfer the eggs to a plate and repeat the process with the other 4 eggs. Remove the bacon from the sheet pan and blot with paper towel to remove excess fat. 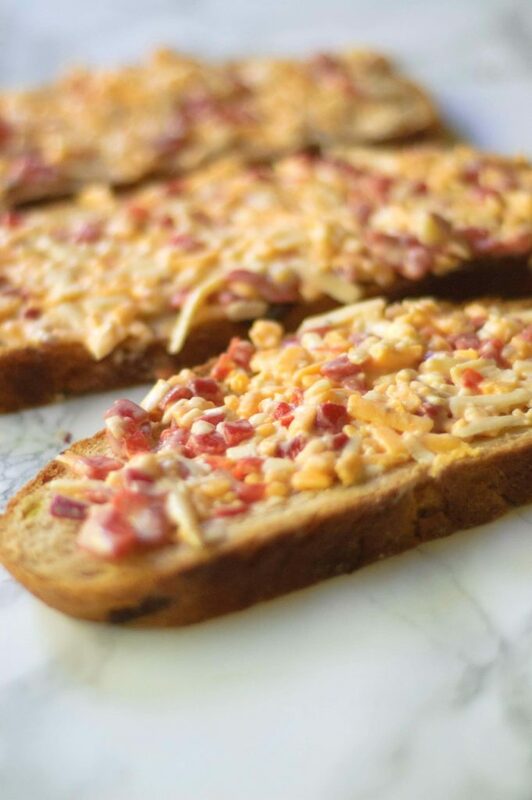 Spread the pimento cheese on one side of each slice of bread. Top it with two slices of bacon and two fried eggs. Cover each sandwich with the top slice of bread (pimento cheese side down) and serve.